The Keys are not what you call a bustling metropolis. Most metropolitan dwellers come to the Keys to escape their everyday, busy city lives. For most people its just that, a vacation. But for me, and the other three interns for REEF’s 2018 summer semester, its our current home. I am not in Nova Scotia anymore, that’s for sure. I am fairly familiar with the area as I have been coming down to dive it the past six years. But since I’ve started at REEF, I have gotten the opportunity to know the community better. My supervisor, Ellie, set up meetings for me and the other interns with other organizations in the area over the course of our first couple weeks. This included the History of Diving Museum, The Coral Restoration Foundation and The Florida Keys Wild Bird Rehabilitation Center. Each of these organizations is filled with passionate people who are dedicated to spreading the good work of environmental conservation across the Keys. Its an exciting place for me to be as I explore the potential pathways for my career. For those who don’t know, REEF has four main categories of focus: The Grouper Moon Project, The Invasive Lionfish Program, the Volunteer Fish Survey Project (VFSP) and the Explorers Education Program. I will talk more in depth of each of these categories in future posts. As an intern here, I have the opportunity to add to or take on a project that is in line with REEF’s focus. I am particularly interested in the VFSP because since its beginnings in 1993, it is now the world’s largest database on marine fishes! I plan to contribute to its database while I’m here by diving as much as possible. Being able to identify the fish in the area is giving me a greater sense of appreciation for everything I see, big and small. The VSFP is a great way to encourage already ocean concerned people, like scuba divers, to participate in the bigger picture of conservation. It is also a great resource for scientists and researches. But what about those who don’t have a background with the ocean? How can the REEF database be used to engage the rest of the public on issues of conservation? Stay tuned as I try to answer this question over the course of my internship. 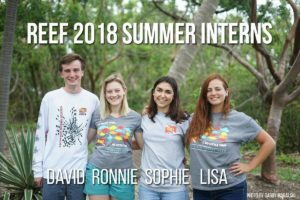 This entry was posted in 2018 REEF, Current Internships, Internship Journeys on June 14, 2018 by Ronnie Noonan.